By Wayan Vota on March 22, 2012 | Comments Off on The Top 5 Countries for ICT4D in Africa are Kenya, Ghana, Nigeria, Tanzania, and…? Ghana has a similar enabling environment, if a somewhat smaller population and therefore market size. Let’s not stop there. 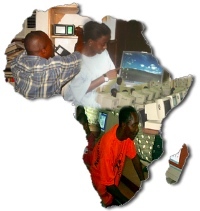 If you were to make a list of the top 5 countries for ICT4D in Africa, which would be on your list? Which would not? And why?